Samsung has unveiled one of its most unique smartphones to date: the Galaxy A80. This model features a sliding pop-up camera array that contains a 48MP F2. 0 main camera, an 8MP F2. 2 ultrawide camera and a time-of-flight sensor. 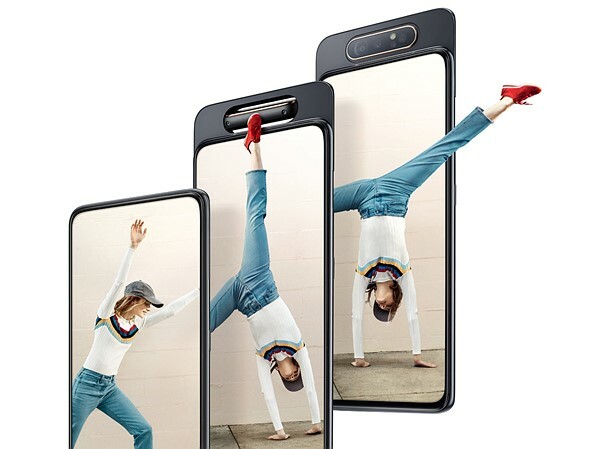 A rotation mechanism enables the cameras to flip from facing the rear to the front of the phone when appropriate, eliminating the need for a 'notch' or 'hole punch' in the display. Cameras aside, the Galaxy A80 features a 6. 7" Full HD+ 1080 x 2400 Super AMOLED display alongside 8GB of RAM, 128GB of storage, and a 3700mAh battery. The model supports fast charging and has a fingerprint sensor embedded in the display.